Aruba, a tiny island off the coast of Venezuela, might not be the most obvious choice for a Caribbean holiday, but it is rapidly becoming a very popular destination for tourists seeking unspoiled Caribbean charm combined with a 5* getaway. The island prides itself on having a reputation for being a total relaxation destination and many visitors who come to the island do nothing but relax for the entire length of their stay. Visitors looking to unwind in luxurious surroundings can find all that and more at some of the finest resort hotels in the Caribbean. If want to spend your entire vacation lying beneath an azure blue sky, soaking up the sun in the lap of complete luxury, surrounded by every amenity your heart could possible desire, then Aruba has plenty of world class resorts complexes for you. The big names like Radisson, Hyatt, and Marriott, all have their places on the stunning Aruba coastline. Eagle Beach is one of the main resort areas of the island and many of the big hotels are located here. Time shares are also very popular with American visitors. 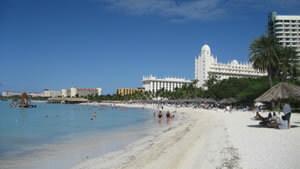 They offer a great way to spend holiday time in Aruba on a regular basis. If for some reason you fancy a change of scenery, you can simply swap your timeshare for a different resort. But whilst the all inclusive resorts are undoubtedly very popular, especially with families, there is a great deal of choice for those seeking something cheaper or lower key. You can choose from self catering apartments and villas, beach bungalows, as well as the more traditional low rise hotels. Self catering accommodation can be found all over the island. This offers a degree of flexibility and the opportunity to spend more time experiencing the true heart of Aruba. Staying in a top resort is great for those who never want to stray too far from the pool-side bar, but it does little to encourage you to explore the island’s rugged landscape beyond the tourist hotspots. Why not try self catering or time share accommodation—that way you can mingle with the friendly locals while shopping for groceries. Imagine waking up in the morning to the sound of the sea outside your beach bungalow, then strolling to the local store for some fresh fruit and a chat. Come to Aruba and experience the charm and unique character of this exceptionally beautiful Caribbean island.